Is livening-up our yard right now. 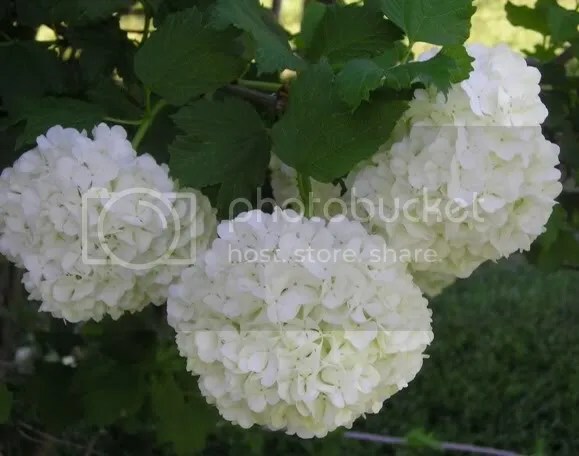 It’s fluffy white blooms look like huge snow balls bedecking the shrub in a festive way. Before the flowers are fully open they are light green, which I’m sure would appeal to all those green flower lovers out there. Viburnum opulus ‘Roseum’ I first mistook this plant for the oakleaf hydrangea. Thank you to Donna at Mother Nature’s Garden for identifying the plant for me. This cultivar is also known as “sterile” because it does not have the typical viburnum berries in autumn. According to gardening literature, it is a typical Southern-gown plant. My only complaint is it looks like this and gets progressively worse during the season. As you can see in the photo the branches are very slender and incapable of holding up the large blooms. I leave you with another iris photo. Have a lovely Monday, everyone! Thank you for the clarification. I hate trying to ID plants that I didn’t plant! 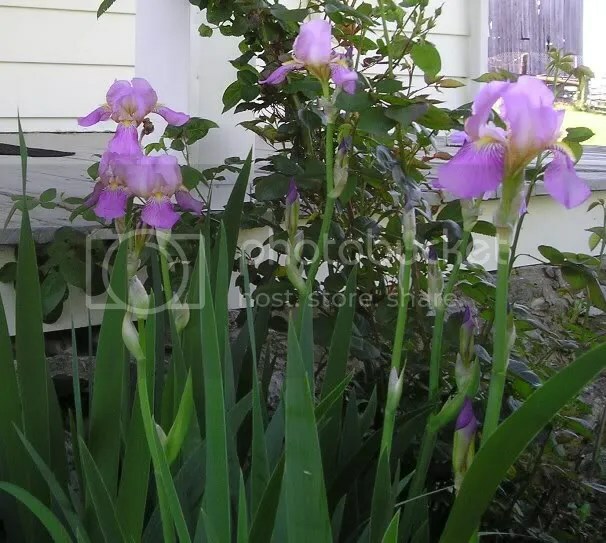 Aaaahhh, that lovely iris! And I love the green-to-white blooms on the viburnum. 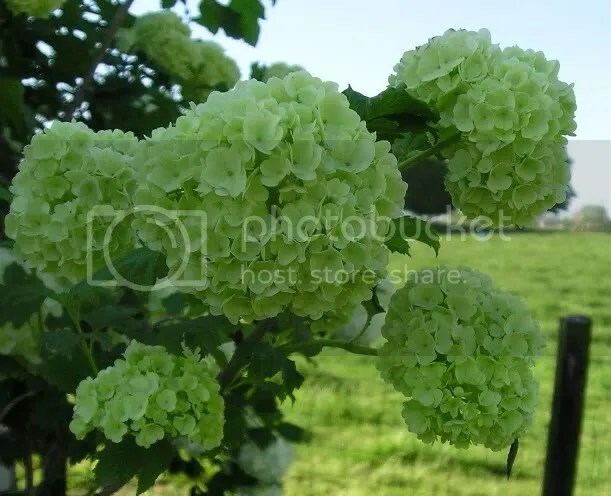 I fondly remember my Grandma’s row of hydrangeas with its white-to-green progression! Thank you, Cherry! They do look delicious. I love the look of the flowers. They really have a spring/summer feeling, like white slipcovers. What fortune to have a pirate namesake! I have a feeling Silence won’t be hearing the end of that one. I want I pirate persona now too bad there weren’t any named Elizabeth. Hi Gail, Yes, Viburnums are a wonderful and very diverse species. I didn’t even realize opulus was a viburnum! I’m familiar with the textured leathery kind that gets berries. Rusty has beautiful gloss leaves and I love the name. Thanks for the recommendation! I mistook this plant for an oakleaf hydrangea also. Do you have any problems with small caterpillars? or Japanese beetles? I started working in a private garden last year and this bush was severely damaged by pest. Now it’s watered regularly and gets compost to enrich the poor soil. It’s blooming now, but the leaves are still full of wholes. I wonder if there is anything else I can do to make this bush healthier. I’m glad I’m not the only one! I’m a native Northerner, so I had never seen this Southern beauty before! 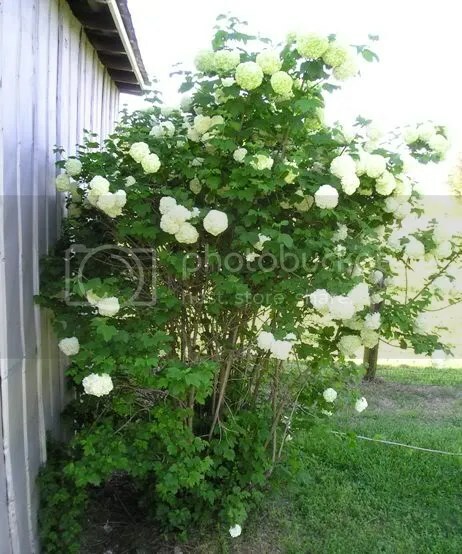 Sounds like you’re on the right track with compost, etc., The bush is very healthy for me in full sun, I haven’t had any problems, but I do know that Japanese beetles love my regular hydrangeas for some reason, perhaps a bag style Japanese beetle trap would help. Thanks for stopping by, Joanne.